Duck Soup Productions presents ‘Fame – The Musical’ at the Orillia Opera House until Aug. 20. The story takes place at New York City’s High School of Performing Arts during its final years. Or learn how to fly? While both are impossibilities in the literal sense, Duck Soup Productions shows the potential for human achievement is indeed limitless, if you’re willing to put in the work. 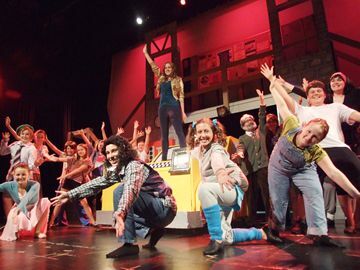 The local theatre company is underway with performances of ‘Fame – The Musical, at the Orillia Opera House until Aug. 20. First presented as a hit movie and then a popular television series, ‘Fame’ follows a group of students as they audition and gain entry to the High School of Performing Arts in New York City. Pushed to their limits – and beyond – the students undergo grueling training, both academically and artistically while wrestling with a range of issues, including prejudice and literacy. The young people’s theatre company is mounting its latest production with a cast of 25, some of them relative veterans of the local group. “A few of them come home from college or university,” Patton says. “There is always a place for them here in the summer until they find their bearings. It is always sad to see them go. “They help each other, they are supportive of each other and they mentor each other, which is really awesome,” she adds. On a personal level, Patton harbors fond memories of Fame the television series, with its high-energy dance routines and often-gritty realism. “I was never much of a TV person, but I would never miss Fame, and I would never miss ‘The Muppet Show,’” she adds with a laugh. Patton notes that students at the now-shuttered Park Street Collegiate Institute constructed the stage sets. “They actually used some wood that they had lying around, which happened to be the old bleachers from the gym,” she says. “Any time you see the railings or the treads of the stairs, or the bases of a lot of pieces, it is all bleacher seats. The show runs July 30, Aug. 6, 13 and 20. Tickets are $18 and performances start at 7 p.m.